It’s the Great Big Crybaby, Charlie Brown! flame resistant. Since candlelit pumpkins are popular on Halloween, a flame resistant Halloween costume is very important. Although it is easy to buy a Halloween costume that is flame resistant by simply checking the label, if you are making a homemade costume, be sure to use flame resistant materials. easily visible at night, which might include some kind of reflective tape or other bright and reflective materials incorporated into the costume. well fitted to your child and not too long so that it can make your child trip and fall, a leading cause of injuries on Halloween. Masks, hats, and other accessories, such as a sword, should also be appropriate to your child’s size. In addition, to help make sure your child can see and can be seen, you might incorporate a flashlight into your child’s costume. Although homemade Halloween costumes seem an inexpensive and fun alternative to store bought costumes, you do need to be sure that they are safe. The “ghost” trick-or-treating in our picture is a good example of a homemade costume that isn’t safe. The sheet is too long, which poses a tripping hazard, and the face opening isn’t large enough to make sure that the child can see well. In one sense, this is perfectly harmless advice—perhaps useful, though you’d have to be pretty thick not to think of it yourself. In another sense, it encourages a ridiculous degree of parental anxiety and paranoia. From skinned or bruised knees to being burned alive by a jack-o-lantern, your children are at risk! Don’t make things worse by letting little Heath or Amber wear a homemade costume. Store-bought ones are created in OSHA-regulated factories, and probably look better than your crappy cardboard-box robot, anyway. (And those knobs on the chest wouldn’t be secured with Elmer’s glue, would they? They could easily pop off and present a choking hazard!) As far as irrational fears go, at least satanic panic always had the benefit of being funny, and even a kid could see through the razor-in-the-Snickers horror stories. This safety stuff is just soul-sucking, and I don’t mean in the Lovecraftian sense. Here’s a fun and instructive Halloween drinking game: Rent Charles Schulz’s classic It’s the Great Pumpkin, Charlie Brown! and take a shot every time the “Peanuts” gang is depicted engaging in high-risk behavior. 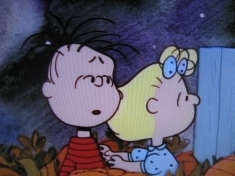 Good examples include Charlie Brown’s clumsiness with scissors, Linus waiting in the pumpkin patch without appropriate cold-weather gear, the “Flying Ace” piloting a WWI-era doghouse, and Lucy Van Pelt kissing Snoopy without a dental dam. At just twenty-five minutes, it’s the perfect party pre-game. Just make sure you don’t operate any heavy equipment afterward.